A simple quiche can make a very satisfying meal and it can be customized to your own tastes with ingredients you already have on hand. 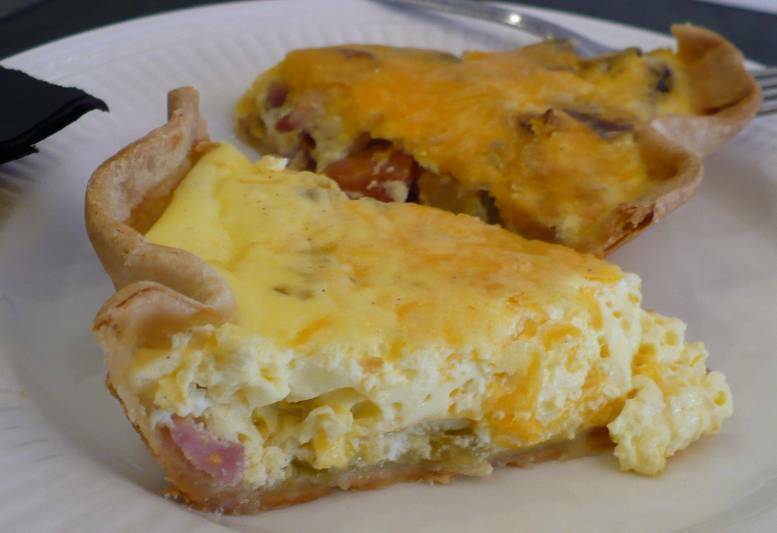 Usually when people hear the word "quiche" they think of Quiche Lorraine, which is an elegant dish made using Gruyere cheese, which can be a little pricey. Although it is quite delicious, Gruyere is also not always a favorite with kids. 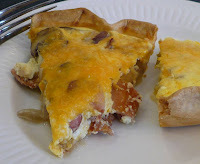 For this recipe we made the whole family happy by making 2 different varieties of quiche at once. For protein you could try pepperoni, salami, leftover lunch meats like ham or turkey, and any variety of cheeses. Just mix and match the ingredients until you find your favorite combination. I did cheat a little on the crust for this batch. Although homemade crust is so very light and flaky, (I have a recipe for homemade crust somewhere and I'll post it later) when you're crunched for time the store-bought crust will work just fine. Open pie crusts and cook according to package directions, with one crust in the bottom of each pie plate. (I used 2 deep pie pans so the crust can be pulled high up on the sides.) Be sure to pierce the crust lightly with a fork to allow the steam to escape. If you have pie weights, these are used to keep the crust flat while cooking. **No pie weights?? No problem. Lay a large square of heavy duty foil on the counter and place 1 cup of dried beans in the center. Fold the edges up tightly until the foil packet will fit inside the pie plates. These can be reused many times! While the crusts are cooking get your filling ingredients ready. In a large bowl, scramble the eggs and add the milk, half and half, sour cream, salt and peppers. Set aside. In a medium skillet, melt butter over medium heat and saute the red onions and mushrooms. Set aside to cool slightly. When shells are cooked, place the filling ingredients in each pie plate. 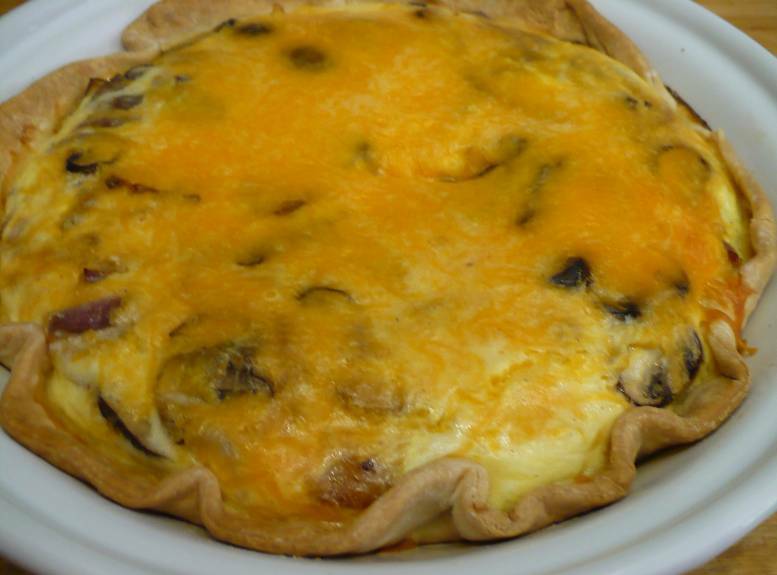 For the first quiche, layer the bacon on the bottom, then spoon the red onion and mushroom mixture over the bacon. Sprinkle with 1 cup cheddar cheese. For the second quiche, place the ham, green chilies and cheddar cheese in the pie plate in layers. Carefully add the scrambled egg mixture to the pie plates, making sure not to overfill the shells. If you have any egg mixture left over, it can be refrigerated and safely used the next day. 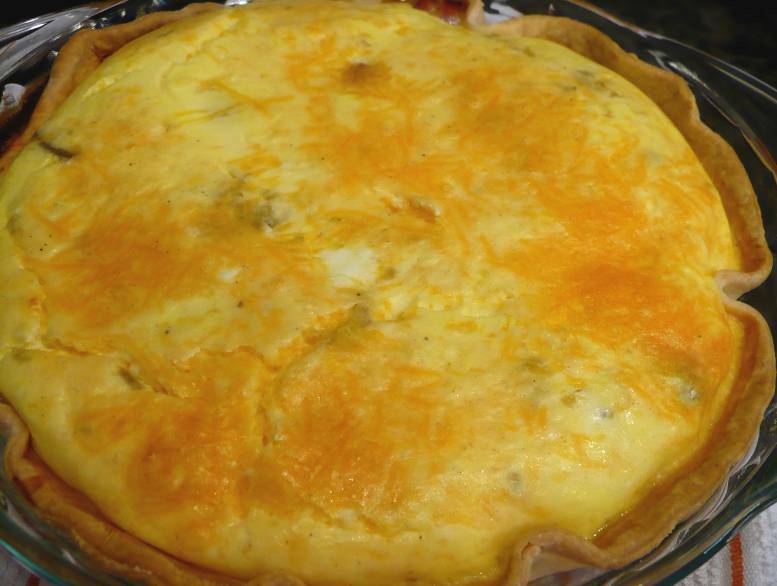 Bake the quiche at 375 degrees for about 30 minutes or until quiche filling is set and the top is lightly browned. Serve with sliced tomato and avocado or a tossed salad. Enjoy! 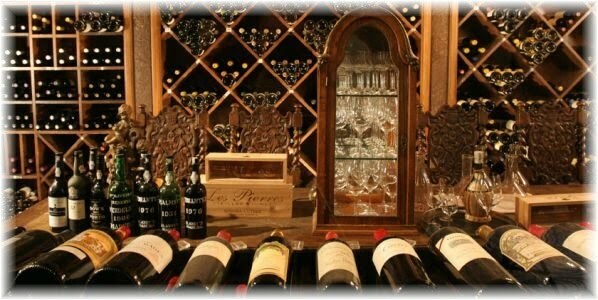 I can see how this would be a very popular evening meal. Both combinations sound great. Those would be great reheated for breakfast too, I think! They are delicious reheated. Makes an easy warm-it-up breakfast for kids on their way to school, too. Thanks for visiting! !